They are adorable pets but they can get a little grubby, especially dogs who have no concept of personal hygiene in my opinion, but happily there is a answer to disheveled doggies and polluted parrots and it comes from the cradle of invention and sharp business practices Thailand! It would do wouldn’t it. 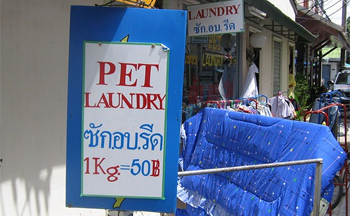 Ladies and gentlemen dear cuddly readers one and all I give you the revolutionary Bangkok Pet Laundry! I wondered as this sign looks a little temporary what the Bangkok Pet Laundry was last week, judging by the bits of green that are peeping out at the top and the bottom I am going to take a wild guess and suggest that until recently the Bangkok Pet Laundry was a Parrot Purifying shop! Their sign and also the reason why they went out of business were obviously one and the same – they were both poorly conceived and executed. 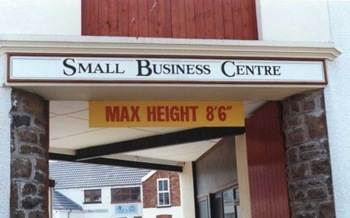 There is something to be said for small businesses but don’t you agree that they should have any restrictions put upon them! No glass ceiling here sadly! A laptop from an ad co – what a silly idea! As an Apple user I can’t think of many things worse than all of the Intel inspired PC laptops that have an uncanny resemblance to Apple Powerbooks, until I came across the Google Chromebook and so I would like to take a minute to thank Google for producing such a pile of scrap Aluminium. Now why would The Cat care about something so inconsequential as a laptop from Google I hear you ask? Well I don’t know if you have noticed but Google is an advertising company which relies on you and I using its search engine to spy on us and serve ‘personalised'(yes I know their definition of ‘personalised’ is a bit odd) ads which are brought to you based on the results of your searches and of course as the Microsoft advertising campaign mentioned recently Google reads your emails and does the same. So why do you think that the Chromebook runs most of its applications from the web and that without an internet collection it is more or less useless and may as well be used to prop open doors or something like that. Finally can a company that brings you this sort of product (Google translate) be respected or trusted in any way? 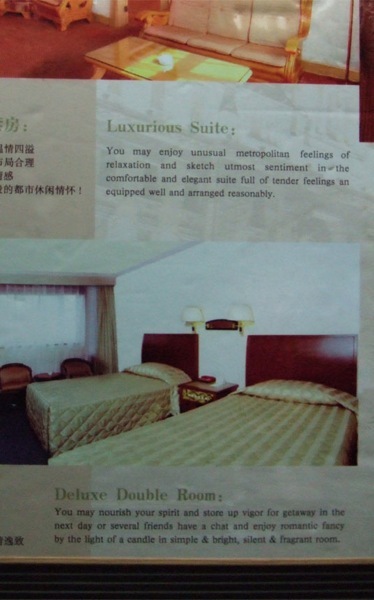 Do you “sketch utmost sentiment in the comfortable and elegant suite full of tender feelings?” I do hope not! If you want to see something rather amusing but with a few swear words in it unfortunately, do have a look at the YouTube clip (I refuse to call them ‘movies,’ it’s YouTube after all) on my Tumblr blog. For some reason I wasn’t able to put it up on my other blogs. This is the short link to it here My Tumblr blog.